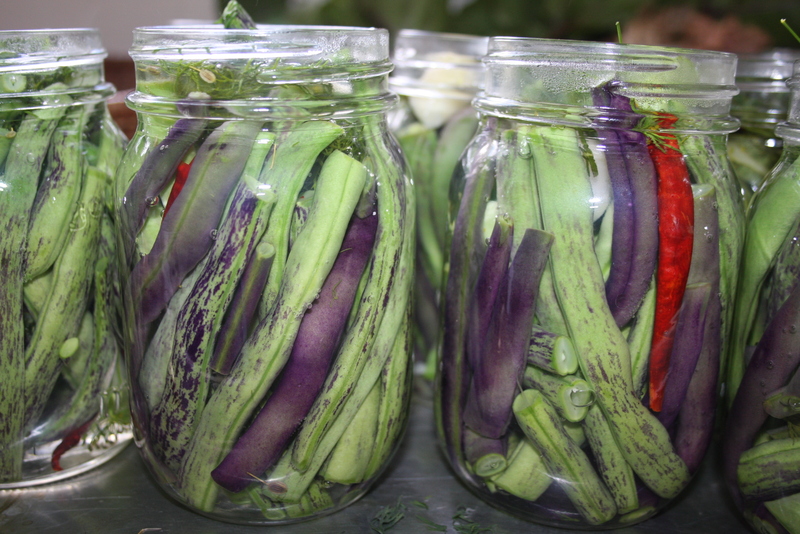 pickling | eating with S.O.L.E. So here it is all of my 2012 harvest canning thus far… most of which is all savory stuff aside from some elderberry cough syrup and apple butter and sauce, the jams are still to come but the fruit is all prepped and cozied into the freezer waiting for some cool fall days. WOW. I just had to haul it all outside to really appreciate the beauty of all of this food in jars, and to take a second to take in my efforts neatly stored in glass; right from seed sowing way back in February through to this day of hauling 10 cases of jars outside for a single picture, it all makes for a HUGE amount of captured energies and satisfaction. Our cedar slab picnic table (that seats 20) is the only thing I could imagine fitting these 120 some jars. 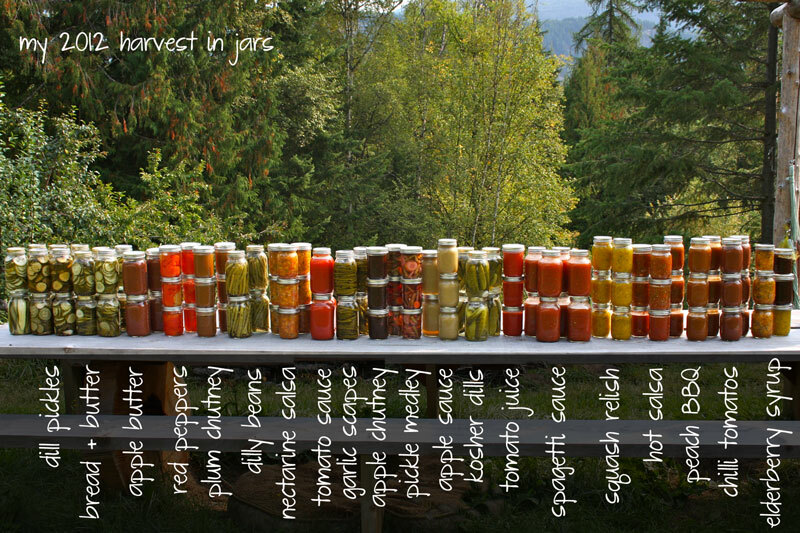 All of this canning was done in the last 2 months (except the garlic pickled scapes those 4 jars were done mid summer). So when I say I have been busy canning, I mean I have really been busy canning! Just wanted to take a moment this stunning equinox day to share my putting up for the cold seasons to come. 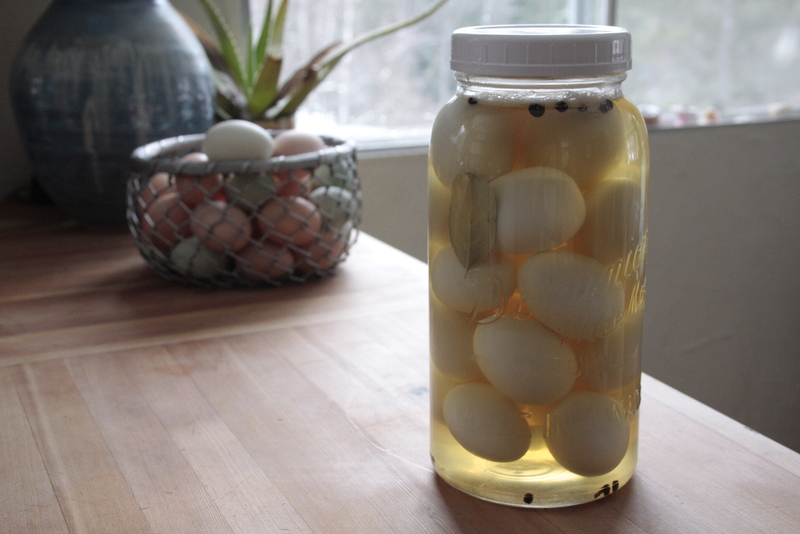 pretty pickled eggs … at long last! I can’t tell you how long I have been wanting to make pickled eggs.. but it seems no one will share in their delight with me. On this cloudy sunday morning after peaking through the mountain of eggs we have on hand, I thought… this is it! Today I will pickle up some eggs, if only for me to enjoy. I can understand the weirdness around the idea of pickled eggs, if one has never tried them before. But frankly if you like pickles and you like hard boiled eggs… then you are certain to enjoy pickled eggs. And if you have ever been to England or a british pub in the west you are very likely to find two jars on the bar top.. one containing pickled eggs and the other likely pickle sausage or at the least big dill pickles, and aside from a pack of crisps if your hungry in the UK at a pub, your not to likely to come a cross a menu of much other than those snackables. So best get used to them! I grew up loving both of those aforementioned pickled oditties and though it has been year and year and years since I have eaten either, it seemed high time to preserve up some of the surplus off winter food we have right now, and get back to one of my earliest childhood food memories. Once cooked immediately remove eggs from the hot water and let them cool in cold water until they are easy to handle and peel. pour boiling brine over top to cover completely, allow to cool a little before capping and refrigerating. 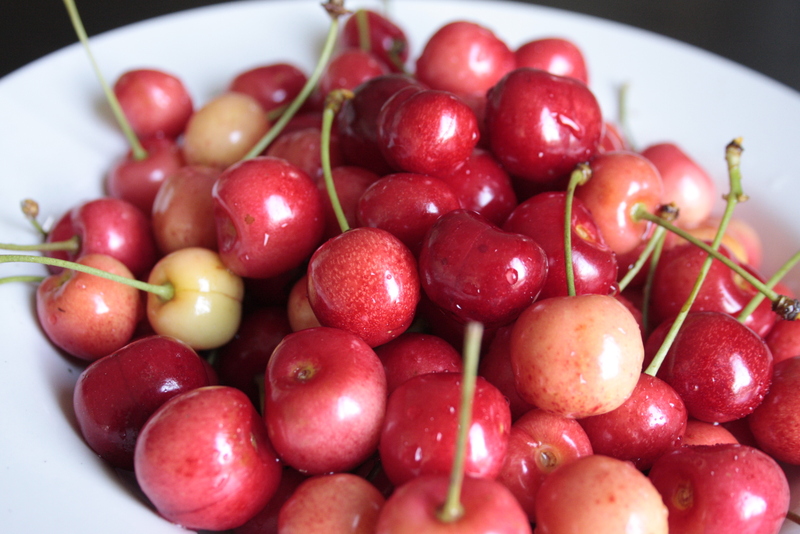 Let them sit in fridge at least 24 hours before eating, and then try to eat them all within a month. * You can hot water bath process pickled eggs into smaller canning jars, for 12 minutes, if you want to give them away as gifts or store them in the pantry. So this is a pretty easy entrance to the world of pickled eggs… who knows you night love them as much as I do!? There doesn’t seem to be an end to the preserving of things these days…. My sweet neighbor brought over the most beautiful pale green tiny zucchini’s yesterday I sliced them up along with some beautiful jumbo shallots and made mustard garlic quick refrigerator pickles, which smells divine! I can’t wait to try these. I also did a huge batch of sauerkraut both green cabbage flavored with juniper berries and red cabbage with some garlic and hot chili too. Just had a cool reminder that fall is around the corner this week, which has me getting my winter greens in the ground, and starting to forge forward on the coop building, commencing tomorrow! I have a weekend with our mom’s visiting so I am hopeful that they will want to help me get the garden together and slap some earthen plaster around. Last night I fired up the wood stove and decided to do a round of pickling inside, as I was growing wiry of the camp stove kitchen set up, the problem is that massive caldron of water took nearly 4.5 hours to boil, even with our fireplace burning at a raging 500º the whole time! The whole batch was sweaty and frustrating, but I yielded my favorite pickled veg; carrots! During the day we visited some neighbors and Mia picked some beautiful purple carrots from their garden, which I added to some orange ones we got at the Nelson market, along with some local garlic, dill, hot peppers, and a few of our tiny carrot ball variety thrown in for good measure. While waiting for the vat of water to boil I whipped up a yellow summer salad to die for; I sliced some yellow sunburst squash paper thin, along with some thicker slices of these darling crisp little lemon yellow cucumbers we are growing, added some thin slices of locally grown organic yellow watermelon, & some tiny yellow heirloom tomatoes, all topped with a drizzle of lemon juice, olive oil, lemon and lavender sea salt and some fresh purple and green basil and a pinch of fennel tops all fresh from the herb spiral. I have seen watermelon and tomato salads many times before and never had the desire to try one, until my good friend and foodie reminded me on her recent visit how amazing the combination was, that and the fact the watermelon was yellow was all the convincing I needed. Mmmm, it was stunning and I will defiantly play with this combination of flavors again. After the long weekend, I hope to have pictures of the chicken coop progress. Finally today I got around to harvesting a big bunch of purple beans and rattlesnake beans which are a striking green bean with purple markings. I dug out the canning equipment at set to work in my outdoor “kitchen” ie: coleman stove, to do some pickling. The sad thing about processing or even cooking all my pretty heirloom beans is as soon as you add heat they resort to common green bean in appearance. I managed to get enough today to do 6 pint jars of spicy garlic dill beans and with a neighborly trade, the last of my plums for 2 long english cucumbers, I managed also to get 5 jars of pickles done too! I had dreams of pickling carrots until the cows come home but I grew these stupid little Romeo round heirloom carrots, which as nice as they taste are way way too small to do much with other than admire and eat from the garden, like a two bite brownie. As I said the last of the plums are down and I yielded about 10 lbs of now frozen pitted diced plums along with the dozens we ate and baked, all and all the yield from this wiry old tree was entirely respectable. I was really fortunate to join my neighbors for a short time yesterday while they harvested wheat and oats, 2 acres, naturally grown with no chemicals. The harvest was done with no combine or too much conventional farming equipment. It was amazing to take it all in. I have promised to clear my schedule in 3 weeks to participate fully in the Buckwheat harvest, I will bring my camera along and share images of the brilliant hand made farm equipment in use. I can’t wait. I am trying to get my winter cold hardy veg in the ground, but I have so much in the bed I am waiting to seed I am finding it hard to make enough room, I really can’t procrastinate much longer. Well I just finished kimchi part 2 and it was sooooo very easy! I did 5 jars of squash kimchi, 1 large jar of sauerkraut all the while I drank gin with elderflower syrup and soda water. The drink is divine; slightly sour crisp with a floral finish, I used my best organic green juniper berry gin and I can’t imagine a more refreshing summer night drink. Next year I will collect way more elderflowers and make more than 3L of syrup, which is what I yielded after two batches. 2L I have ready to drink and I froze 1L down to use for making plum jelly, just as soon as my plumbs are ripe. I also broke down and made zucchini bread today; I know I know everyone hates the stuff, but inspired by “A home made Life by Molly Wizenberg” and her ginger chocolate banana bread so I tricked my daughter into making chocolate ginger bread with just a little bit of zucchini 🙂 instead of bananas. I used the Joy of Cooking’s zucchini bread recipe with lots of tweaks (as I usually do) I added cocoa powder, diced candy ginger, and lots of Callebaut chocolate chunks, and it passed the Mia test! Busy days on the home front! The past week was spent cooking for the troops and unfortunately less time in the garden. However I have been harvesting some amazing things! I have no end of huge Yukon Gold potatoes, and I have been gushing at all the tri coloured star burst squash. The other day my garden made the best ever salad: butter letus, endive, yellow starburst squash, purple pole beans, cucumber (the first one), purple basil, lemon basil, dill and anise greens: OMG with a little goat cheese from down the street and a handful of sunflower seeds with lemon mustard vinaigrette, it was a sunny summer day in ever bite! I finished my first batch of elderflower syrup, and found my neighbours tree was flush with a dozen new flower bursts so I started a second batch. I also harvested some more saskatoon berries which are drying, shucked some peas (although I didn’t plant nearly enough), I also collected some pineapple chammomile growing wild on the driveway, which is also drying for tea. All of these tasty adventures and by far the most exciting thing I have to report is my sheet mulch garden has been pretty darn successful! I dug out a volunteer potato plant that crept up in the middle of my lasagne garden bed and low and behold when I dug the tatters out I found soil! Deep black earth full of fat and juicy worms and critters, the soil was deep and dark and from the sandy stale state it was in back in May, it has come a long way! The chooks are growing and we ‘ll have eggs soon enough! I can’t wait to have a rainbow of eggs collected fresh each day. I have been watching the plum tree for the first sight of ripe plums, and I am eager to harvest elderberries too! I have also just been told about small dukabor bear apples growing all along the rails to trails pathway, I plan to harvest and dry in cinnamon rings this fall too. I had better get my old vintage stove top running in time to do some canning and preserving soon! The image in the slide show of the stunning spread of squash was my fabulous dinner the other night: one huge squash cut razor thin and raw drown in a citrus garlic dressing. It was divine. “I have also decided to amend my cooking with S.O.L.E blog: while living in the city, seeking out Sustainable, Organic, Local and Ethical Food could be quite a challenge, and cooking with found treasures, while meeting sustainable farmers was really enjoyable, but now that I am living as part of a food system that is so strongly founded in my ethics of eating I am going to shift my blog focus to my adventures in harvesting and preserving and preparing the bounty of my local Food Shed. The blog will be renamed FOOD SHED (in Kootenay time), and I can’t wait to get cooking, fermenting, drying, canning, cold cellaring and over wintering my bounty and sharing my trails and successes. 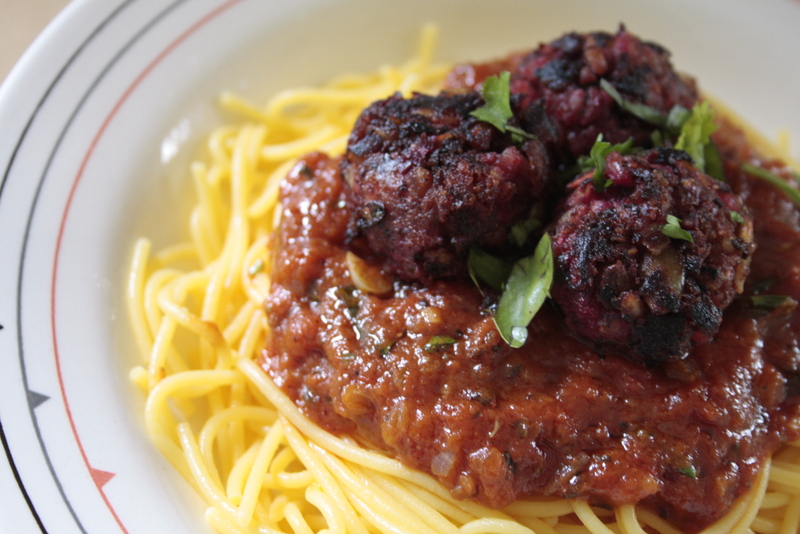 This dinner was picture perfect spaghetti and meat balls, only batter. It was Wheat Free, Vegan, and totally guilt free. When I made the below barley beet and bean burgers I set aside about 1/3 of the batch which yielded about 10-12 patties total. The portion I didn’t turn into patties I rolled into little bit size “meat”balls which I browned for dinner last night. Dinner came together in about 15 minutes and was super easy. I started with 1/2 of a red onion and a few cloves of garlic diced and browned, simmer this with a can of tomatoes, whole stewed if you like your sauce chunky or crushed if you like it a little smoother. * I can’t wait to savor the first tomatoes from the garden this year! anyways as for garden goodie these day I had a bunch of basil and some parsley so I diced this up and added it to the simple sauce along with a pinch of S+P and a squeeze of lemon. In a separate pan (or the sauce pan if you want to do the meatballs first; simply brown the formed and refrigerated balls in olive oil slowly, rolling them around often to evenly brown all sides. Boil a package of Organic corn spaghetti toss it all together and top with more fresh herbs! Viola. The only thing weird about this burger is that the beets give the patties a raw red meat colour! That aside these patties are really substantial and tasty. I added cheese into the mix but you could leave it aside for a great vegan patty which I have made with tofu instead of cheese many times. Also we devoured them so quickly I didn’t have a chance to take a picture of one all dolled up, so as you can see I just have a shot of my little one enjoying a big bite! Boil 1 cup of pearl barley with 2 1/4 cups of water for 20 minutes or until water is absorbed (this recipe will work best if the barley is a little mushy and over cooked). While your boiling the grain; grate about 1/2 c of sweet potato,1/2 c beet and 1 carrot blend in large bowl and mix with 1 tbsp canola oil, S+P, 1/4 cup goat feta chopped or medium tofu, 1 tbsp pesto, 1/4 c pumpkin seeds, & 1 tbsp flax seeds. Blend all of this together with 1 can of refried pinto beans and the hot barley once it’s cooked. Form into patties and refrigerate to set up for as much time as you can up to 1 day. I don’t have an working oven right now (so sad I know:( I have a beautiful vinatge stove out in the wood shed with no electrician to help me rewire it yet) so I had to just pan fry these, but I would suggest that you bake the patties on a cookie sheet at about 350º for 20 minutes and then pan sear them in hot oil until both sides are golden brown. I had to sear them off then reduce the heat to allow the inside to cook a little. Dress and serve these as you would any burger, enjoy!